Use npm as a build tool for compiling Typescript, monitoring changes, and restarting development server. Why use npm instead of gulp? It reduces number of dependencies. This reduces both total project size (as no more gulp modules are needed), and number of things that can go wrong. 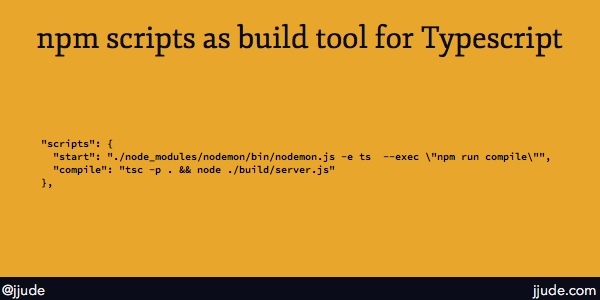 So let me explain how I use npm as a build tool for Typescript files. Let me start with package.json. This is the default package.json when I start with npm init. This is expected. Why? There is only one script mentioned, and that echos that there is no test. I’m not focusing on testing in this post. It will be a dedicated post in the Learn to build web-applications with Hapijs and Typescript series. Let me add scripts specific to Typescript now. First is a script to compile Typescript files. This script below invokes typescript compiler. "compile": "tsc --outDir ./build --module commonjs ./src/*.ts"
Now if I invoke, npm compile, typescript files in ./src folder will be compiled into ./build folder. "compile": "tsc --outDir ./build --module commonjs ./src/*.ts && node ./build/server.js"
This is fine. But whenever I change the file, I need to run npm compile. Can it watch for changes to files and invoke this command automatically? Nodemon provides the watching facility. I already use nodemon. Nodemon can watch for changes for certain file extensions and execute a command. So I’m going to add another script to the scripts block. If any ts files changes, then nodemon will invoke npm compile, which in turn compiles and (re-)starts the node server. Perfect. Now I start the server with npm start and go on with my development. As I change the Typescript files, they will be compiled and server restarted automatically.